This is a piece of art that a city selected to plop down in a median between busy roads, in addition to a number of other interesting works throughout the city. But what if this piece of art was more than it seemed? 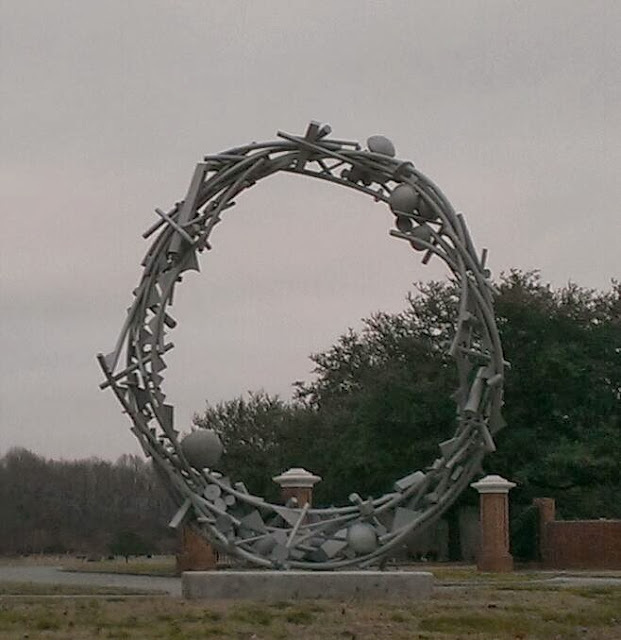 Maybe it's an ancient Stargate, or a portal to a magical realm, or allows people to 'slide' into a parallel universe. Or, maybe it really is just a big, costly piece of taxpayer-funded art. Write a little Flashy Fiction about it. Today we think in terms of Alpha and Omega; First and Last! 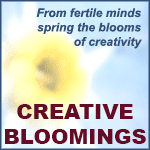 This is fitting, being the FIRST prompt of the new association with CREATIVE BLOOMINGS. We certainly don't plan on it being the LAST by any stretch of the imagination! Now choose one of these that stands out most, and write a piece of flash fiction placing your character in that situation and how they would deal with it. And you can veer from the "script" at any time! Let your imagination soar. For a bit of a challenge combine one of your "firsts" with one of your "lasts" and write that! I bought my first car with my last dime. The first day at school was the last time I saw..., The last day at work before my first child was born. It changes the dynamic a bit. Give it your best shot and post your story below. We all have a way of spinning a tale! Add a link to your blog. We'd like to read whatever else you've been writing! And remember, on FLASHY FICTION FRIDAY, everyone has a "little" story to tell! What do the names RJ Clarken, Walt Wojtanik, Hannah Gosselin, Laurie Kolp, De Jackson, Rob Halpin, Aimee Halpin and the late Dyson McIllwain have in common? They all probably first crossed paths at Poetic Asides with Robert Lee Brewer. They have been fervent contributors here at POETIC BLOOMINGS. But, what many may not know, they have all served as administrators and prompters at the flash fiction site, FLASHY FICTION. You may notice the look here is changing and than means different routines and habits. We're willing to put up with it as long as it is positive. Rob and Aimee and I believe they are nothing but. 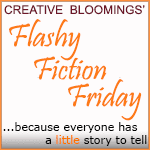 Well, in keeping with this air of change, I would like to announce that FLASHY FICTION will be joining up under our a banner to be a part of FLASHY FICTION FRIDAY over at CREATIVE BLOOMINGS. Rob Halpin and his wife Aimee, along with myself have been keeping the site (which RJ Clarken and her cohorts started back in the early days of Rock… well, not really that long ago!) on life support and I felt this would be a perfect fit for the flash fiction aficionados there at our new and improved site. Flash fiction may not be everyone’s bag of beans, but for those who do flash, it will be a haven which will be more accessible. The three of us will alternate with a new prompt each Friday, with the last Friday being devoted to an instruction, a discussion or an exercise. You may post your efforts in the comment section and/or provide a link to your story on your blog so we can visit your other fine works. Also in this forum we will help develop characters, backgrounds and other aspects of storytelling for those who venture into the NANOWRIMO every November. It may be a helpful tool in this regard. 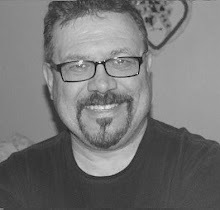 I thank Rob Halpin for his outstanding work, developing the new look at FLASHY FICTION and for getting the “Newer” design of the CREATIVE BLOOMINGS’ FLASHY FICTION FRIDAY up and running so quickly. Those who regularly visit the site will have already seen a “preview” . At FLASHY FICTION FRIDAY we have a tagline: “Everyone has a little story to tell…” Join us on Fridays and try your hand at telling yours. It's been said that the eyes are the gateway to the soul. What do you see when you look into this eye? 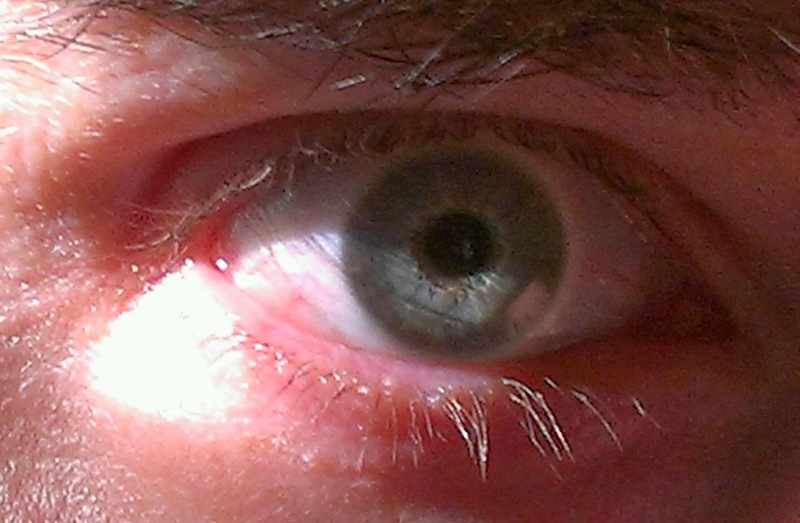 If you looked closely into your own eye in a mirror, what would you see? What about your lover's? Your child's? Write a little Flashy Fiction about gazing into someone's eyes and finding something there. Is it what you expected? It's down on your list, but the most attainable. You've made your resolutions for the new year. Long after working out more, and losing weight, and smoking cessation, this is the one resolution at which you will succeed. In a bit of FLASHY FICTION, tell us about your plans. 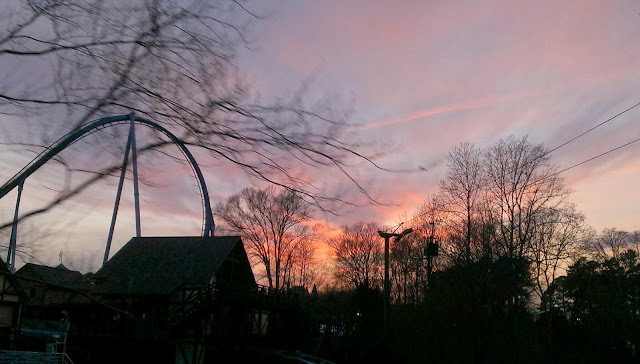 No, this amusement park isn't burning down. The sun is simply setting in dramatic fashion, splashing the nearby clouds with it's red light. A quick glance conveys a different story, though: an illusion of fire. Write a little Flashy Fiction in which something seen at a glance turns out to be something else. Does it cause angst, panic, misplaced trust? "This is a room suffocating with no empty space. Sit in it." Sounds like an episode of the Twilight Zone! So in keeping with the annual Twilight Zone marathon on Syfy, write this scene/fiction. Gasp for air and pen your piece. The new year begins; a threshold to our hopes and dreams. Who knows what 2014 will hold. Write you flashy fiction to explore a goal or wish you may have. Write of a disappointment you expect. Look into the immediate future and let your imagination step into the unknown. Whether you want to make it happen or hope it will, put it out there and see who's listening!